Jim is utterly stunned to hear that Beverly is pregnant. Then he becomes angry that Beverly hasn't told him. Helen protests that Jim was in New York, but he says she could have phoned(!) Helen points out that when Beverly did phone, Rosemary answered the phone, so it seemed as if Jim was with another woman - and now he really is with another woman! HELEN: Jim, this is *your baby* we're talking about! Toby is moping about Bouncer still being missing. He's hoping a golden labrador they've heard about from some people turns out to be Bouncer - Joe has gone to look. Joe comes in and breaks the bad news - it wasn't Bouncer. Toby wants to check the pound again. Joe says that Bouncer has a tag, but Toby says it could have fallen off. Joe relents and agrees to go in the morning - but Toby shouldn't get his hopes up. Clarrie is worried about Rosie being missing. He tells Ryan and Dorothy about Rosie saving his life - she noticed a snake in an outdoor lavatory for him once. CLARRIE: I don't know what I'd do without Rosie. She's been a real friend to me. Dorothy rolls her eyes. When Clarrie has gone to the kitchen, Ryan tells Dorothy off for being hard on Clarrie. She decides to be a bit more sensitive. 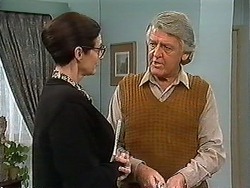 When Clarrie comes back, Dorothy tells him that she hopes he finds Rosie. 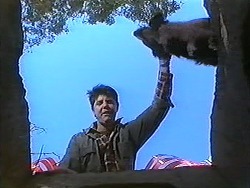 CLARRIE: People let you down, Dorothy, or you let them down...but a dog loves you regardless. 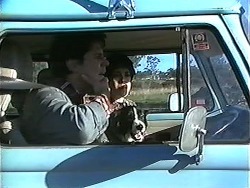 Dorothy tells Clarrie that she's not going away on a holiday she'd planned to the Outback with a friend - with Ryan there she feels she leave him on his own. Jim rings Caroline and tells her he has to cancel their date tonight. 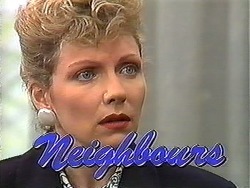 Helen nags Jim to go and see Beverly, but he says he needs to think first - he hasn't got a clue what to say to Beverly. He starts moaning on about Ewan again (give it a rest, Jim) and then tells Helen that a baby won't help them to live happily ever after. HELEN: The wider the gap between you, the harder it's going to be to bridge. Todd is practising the drums on various buckets(!) when Jim calls around. Beverly is at the hospital though. Todd mentions that Beverly is sick a lot at the moment and Jim casually says it's just morning sickness. Todd is stunned to hear that Beverly is pregnant - he thought Beverly just had a virus or something. Jim says he didn't know either. He asks if Beverly ever sees Ewan. TODD: It's all over now. JIM: But there was a relationship? Todd. I'm sorry to put you on the spot like this, and I wouldn't do it if it wasn't very, very important but...did Ewan O'Brien ever stay the night? TODD: ... Yeah. At least once. Clarrie is off out to look for Rosie again while Dorothy looks for her phone book to ring her friend about the holiday. Clarrie tells her to go on the holiday - he could stay on for a while and look after Ryan for her. Dorothy doesn't think he's an appropriate carer as he's down the Waterhole a lot. Clarrie says he mainly goes to the pub for company - and he can be a responsible person when he has reason to be. Dorothy finally agrees - as long as Clarrie agrees not to drink at all while she's away. Joe and Kerry are looking in the cages for Bouncer. Suddenly they see Rosie being walk and rush over to her. The dog walker suggests looking at the log in the ranger's office to see where Rosie was picked up. 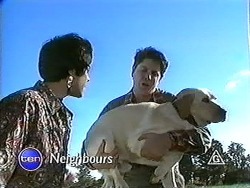 Dorothy asks Helen to keep an eye on Ryan and Clarrie while she's away. 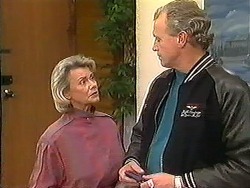 She's not entirely sure about leaving Ryan with Clarrie as Clarrie has "something of a drinking problem". As Dorothy is leaving, Jim arrives home. He tells Helen that something new has come to light on the Beverly situation that will require further thought. He goes off to his room. Beverly comes in from work. TODD: Uncle Jim dropped around. BEVERLEY: What did he want? TODD: Well...I suppose...I suppose he wanted to talk about the baby. Aunt Bev, why didn't you tell me? BEVERLEY: Todd...I'm sorry. I didn't want to say anything to anyone until I'd had an oppotunity to speak to Jim. Well, that opportunity hasn't arisen, worse luck. How's he handling the news? BEVERLEY: I wonder how he found out? Oh, wait. Only two people knew, and one of them lives in the same house. Why can't she just keep out of it?! Dorothy is introducing Helen to Clarrie. 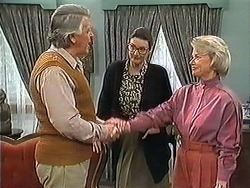 Ryan protests that he and Clarrie don't need a minder, but Clarrie is delighted and invites Helen to dinner! Joe and Kerry, with Rosie in tow, have returned to the site where Rosie was picked up. Rosie runs directly to the hole. Joe follows her. Poor Bouncer is still down there, lying down, unconscious. 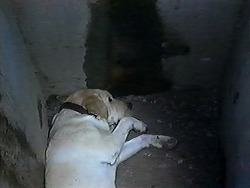 Joe has managed to lift Bouncer out of the hole - they realise he must have been down there for days without food or water. Joe lies him down in the back of the ute. Kerry says they'll have to get him to the vet straight away. Beverly calls around and immediately lays into Helen. BEVERLEY: You told Jim about the baby, didn't you! 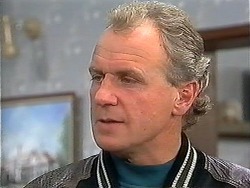 BEVERLEY: You deliberately betrayed my confidence! HELEN: Oh Beverly, it wasn't deliberate. I was angry and I'm afraid I just blurted it out. BEVERLEY: Helen, I thought I could trust you! HELEN: I'm sorry. But I can't help thinking that it's better that he knows. Now you can both start making rational decisions about your future. Toby is delighted that Bouncer has been found. He's still lying down quietly, but he'll be OK after some rest. Kerry goes off to take Rosie home. Dorothy tells Clarrie off for being a shameless flirt with Helen earlier(!) Clarrie says they're both free agents, so it's up to them(!) Ryan brings Rosie in and tells them about the drama with the hole. Also Clarrie owes $175 to the dog pound! Dorothy subs him. Beverly tells Helen that she's planning for an independent life - she doesn't know how Jim will feel about the baby. Just then, Jim comes in, so Helen makes herself scarce. BEVERLEY: Helen told you about the baby. BEVERLEY: And? How do you feel about it? JIM: How do you expect me to feel about it? BEVERLEY: Well...I realise it's come at an awkward time, but I had hoped you'd be pleased! JIM: Well, that all depends, doesn't it. On whether the baby's mine or Ewan O'Brien's.